Since I usually write blog posts by request, unless there’s a pressing thought that I really want to get out and get off my chest, I normally make a list of what I’m supposed to be blogging about. A topic that I saw people insisting upon was the question of how to write an outline for a paper. The process can be escalated to a book, or a doctoral dissertation, a Masters thesis, or an undergraduate honors major paper. I use a couple of methods, and in this post, I discuss two methods I use. Both are inquiry-focused, but in one I set up questions, whereas in the other I basically throw words or sentences and then list and group them to see if they make a coherent argument when assembled. There are, as I mention in my Twitter thread (which you can open by clicking anywhere on the tweet below) other methods, such as IMRAD, Introduction – Body – Conclusion, etc. Mine are just two methods, and hopefully they may be of use to others who are interested in writing outlines for their papers, books and dissertations. I tend to dialogue with myself, and I use writing as a form of conversation, where I am the interlocutor and the speaker too. In the example I posted, where I shared the outline for my ethnographic methods in public policy analysis chapter, I asked questions that can become sections of the paper. Note how the questions I ask may end up becoming sections of my chapter. Also, as I assemble my paper, I write memorandums for each one of these questions. https://t.co/QtktllEpGs this process makes it easier for me to build the entire paper. When I ask questions to myself, I usually add anything that can help me create sentences and paragraphs. For example, in the tweet below, I have used those questions as prompts to force me out of a writing rut. Note that each question could be a separate memorandum https://t.co/hACSfxW6Y4 BUT I just realized these were questions that I could answer in the paper BECAUSE I was writing a memo on a related topic (how sanitation is a public issue). Still, worth answering those questions. This method works really well for me, as I ask for feedback from fellow academics very early in the process. What I did with my paper on the global governance of plastics was that I wrote a list of ideas I had, a list of topic sentences from where I could create entire paragraphs, I gave it some coherence, and asked for feedback from Dr. Robin Nagle and Dr. Kate O’Neill, both experts on waste. I am a big fan of conceptual maps (also known as mind maps). I usually draw them in different colours and I use them to connect ideas, concepts and authors. For example here, I more or less have drawn the connections between local, national and international environmental regulation of plastics, thanks to the feedback Robin and Kate offered. I don’t think there’s anything wrong with having a conversation with oneself on paper, especially when we are at the early stages of composition. I try to always write topic sentences that can have one idea, and then flesh out that idea by assembling additional written sentences until they form an entire paragraph. The “Listing Topic Sentences” method works very well for me when I know the literature so well that I can use it to write topic sentences that I can then flesh out. For example, in this case I link my own work with that of Dr. Malini Ranganathan and Dr. Colin McFarlane. We all three have written about informal sanitation mechanisms. Topic sentences work wonderfully for my writing because they act as prompts or anchors from where I can spin off the thread that will compose my entire argument. This is another example that is a variation from the Listing Topic Sentences, which is Listing Key Ideas. Do note how in the previous case, each concept is one sentence, whereas in the case below, I have a more well thought out idea of what I want to say. I always keep going back-and-forth between my paper, my Everything Notebook and my handwritten conceptual maps. Doing this allows me to maintain control over my ideas and grasp what I’m trying to understand more clearly. The pair of tweets below clearly summarize my approach. To summarize: outlining a paper provides the author with a skeleton of ideas that can later be fleshed out. Having a flexible structure (where you combine the Questions Method with Key Ideas Method) and using mind maps/concept maps helps me clarify my own thinking. One final thought: research is social, contrary to what you hear. When you write, you put ideas down that (if you submit them to a peer reviewed journal) somebody else needs to read and understand. Therefore, the earlier you can share your drafts with fellow scholars, the better developed your argument. Hopefully my method will be useful to students, early career scholars and other fellow academics and writers. Tagged with AcWri, outlines, writing. I recently found you on Twitter because of this thread and I just want to say thank you for doing this! I am a teacher turned researcher for my MA, and also a life sciences students entering sociology & ed literature for the first time. 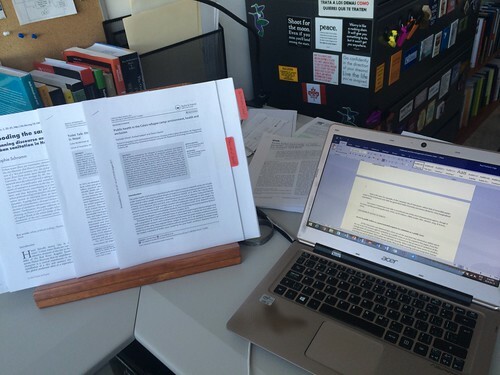 All that to say: I am having such a hard time writing for academia!! !